SAP (software) products are installed on computers. In the on-premise case, you call these technical systems. Keep in mind that each installation is of one specific product version. The units of delivery are called software components (SC); some SCs need to run together on the same technical system. Again, on the technical system, what you see are software component versions. To ensure that each SC can connect to such SCs required on the same system, product instances define such groups of SCs that need to run together. The exact software components and versions depend on the installed product instance version. Each (software) product version of SAP has one or many product instances. The fact that in a product version a set of product instances is used, each of which contains a set of SCs – the target of support packages, is why you in most cases deal with well-defined support package stacks. Figure 1: An example of a standalone and add-on product version installed on A01 shown in the LMDB. While the upcoming changes of handling product systems has been described in detail, here is how to deal with verification in the Maintenance Planner. How Does Verification Work in Principle? Verification checks, if the software listed for a system is a valid a valid combination of versions. This is done by checking, if all SCs found on a specific system are covered by a set of product instances. So there may be missing or superfluous software components (SCs), wrong product version assignments, etc. By the way – many or most errors stem from changes of the system without precise calculation and without describing the new system state in a stack.xml. That is why investment in this area is so important. But first let’s deal with the improvements coming with the Maintenance Planner. The best approach when it comes to error-handling is to avoid them: The most important case of verification is the former product system or now maintenance dependency. Figure 2: The creation of a product system in the LMDB compared to a maintenance dependency in the Maintenance Planner. You see that some product instances running on P00 need to be assigned to E00. In a product system as well as in a maintenance dependency in the Maintenance Planner product instance versions of the same product are assigned to technical systems. The big difference is that In the product system you needed to deal with product instances, which was error-prone, while with the Maintenance Planner you simply assign the dependent technical system – in figure one the portal front-end to the ERP backend system. If you pick two technical systems that do not have a product in common (like E00 and P00 both have parts of SAP ERP 6.05 installed), you will not be allowed to create a maintenance dependency. 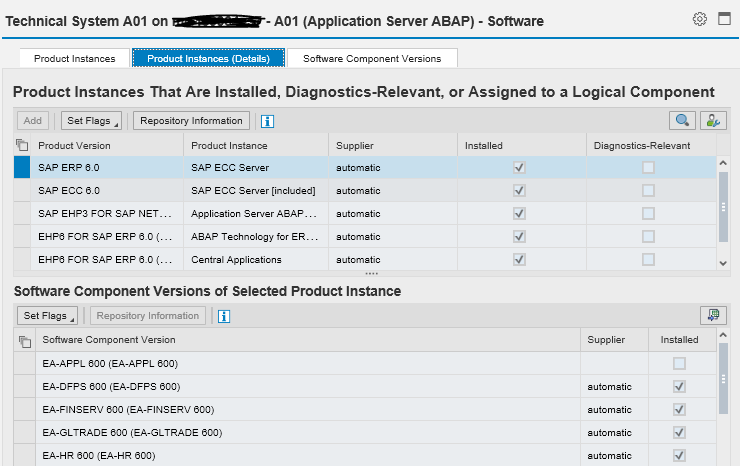 Currently, there are two combinations possible, since Maintenance Planner works with SAP Solution Manager 7.1 and 7.2. This section shall help you understand the differences – and how the unification in verification has improved with SAP Solution Manager 7.2. LMDB sends data to the PPMS, which offers a service in the SAP Support portal, where system data is checked against SAP’s product model. Checks running in the system itself are performed by the SL Tools, mainly the SUM. A product version selected for the update may require an additional update of operation system or database version, which is not part of the calculation in Maintenance Planner or MOpz. Note: You would expect identical results in both cases, and in most cases they are. In fact both verification implementations in the LMDB and the Maintenance Planner are connected to the PPMS calculation service. However, the handling of results in the Maintenance Planner has evolved higher, and therefore the verification results in Maintenance Planner and LMDB may look different. Figure 3: Verification (shown in light green including connections between tools involved). If you compare this with figure 2 showing the situation with SAP Solution Manager 7.2, you’ll see, how the process has been simplified. Figure 4: Verification is only done in the Maintenance Planner; additionally, there are system checks SL Tools.